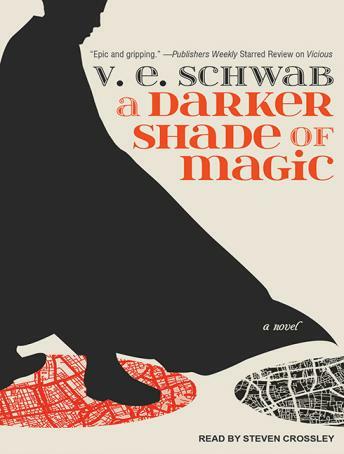 Listen to "A Darker Shade of Magic" on your iOS and Android device. Kell is one of the last Travelers-magicians with a rare, coveted ability to travel between parallel universes-as such, he can choose where he lands. There's Grey London, dirty and boring, without any magic, ruled by a mad King George. Then there's Red London, where life and magic are revered, and the Maresh Dynasty presides over a flourishing empire. There's White London, ruled by whoever has murdered their way to the throne. And once upon a time, there was Black London . . . but no one speaks of that now. Officially, Kell is the Red Traveler, personal ambassador and adopted Prince of Red London, carrying the monthly correspondences between the royals of each London. Unofficially, Kell is a smuggler, servicing people willing to pay for even the smallest glimpses of a world they'll never see-a dangerous hobby, and one that has set him up for accidental treason. Fleeing into Grey London, Kell runs afoul of Delilah Bard, a cutpurse with lofty aspirations. She first robs him, then saves him from a dangerous enemy, and then forces him to spirit her to another world for a proper adventure. This book was surprising to me. I absolutely love this. Everything from the world to the characters. I’m definitely reading the whole series. THIS WAS SO GOOD!!! The worlds are well-built, the characters well-rounded, and the idea of love is focused on loyalty rather than romance itself. Just bought the following book! Very interesting, fast paced. The book is set in London, and the main character is a magic user who can travel between 'red' 'grey' and 'white' Londons, set in three similar yet different Londons with varying states of magic and 3 very different cultures, but near identical geography. The story is easy to follow and doesn't leave any boring chapters. The story is immersive and hints at some things that you have to pay a little bit of attention to in order to catch.